Old Doc Price is an enemy of Obamacare, of course, but he’s also been hostile to the quality revolution in health care. The nomination of Representative Tom Price to become secretary of Health and Human Services has naturally stimulated a lot of debate about what that means for the fate of the Affordable Care Act. Price is, after all, the author of one of the more detailed Obamacare “replacement” initiatives. As chairman of the House Budget Committee, moreover, the Republican Georgia congressman helped put together the 2015 budget reconciliation bill that could provide a model for how Congress and the Trump administration will actually proceed to “repeal and replace” ACA. It is especially relevant to ask whether Price, who practiced as an orthopedic surgeon for two decades, will stick to his past position in support of the complete repeal of the Medicaid expansion ACA created. Doing so would fly in the face of quite a few Republican governors — including Mike Pence — who cut deals with the Obama administration to take the new money in exchange for being allowed to implement conservative health policy “experiments” like patient cost-sharing. Beyond Obamacare, Price’s support for turning Medicare into a program that subsidizes private health-insurance premiums is worth noting as well. Price has also complained that federal policymakers have failed to give sufficient input from “impacted stakeholders” in its efforts (promoted by ACA as well as Obama administration policies generally) to move the system away from the old-school practice of blindly paying for procedures rather than better health-care outcomes. Those “impacted stakeholders” would include Price’s fellow specialist physicians, often considered the prime beneficiaries of fee-for-service reimbursement. 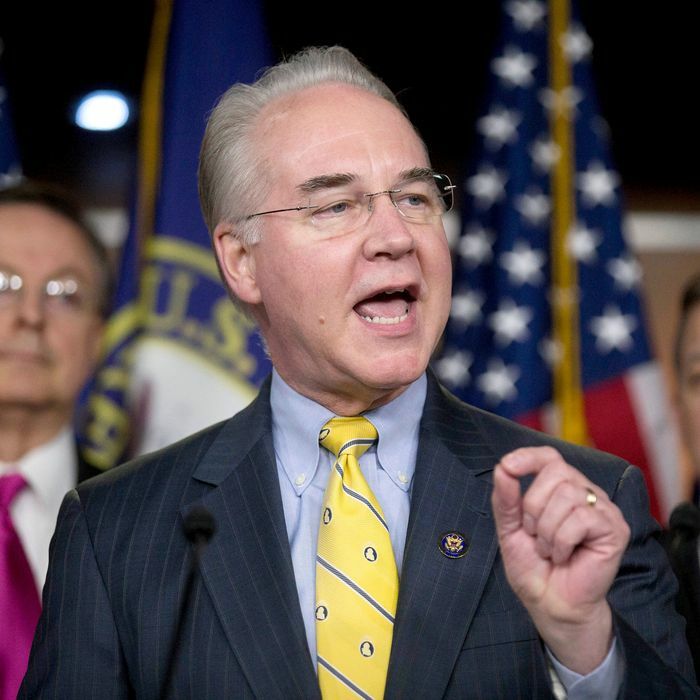 Though his position has been couched in the arcane language of congressional committee jurisdictional squabbles, Price has also been an opponent of initiatives aimed at jump-starting the development of major-disease cures and “precision” drugs customized for individual patients. It is difficult to overemphasize the importance of the trend toward value-based health care to both liberal and conservative health-care cost-containment strategies. There are a variety of policy ideas associated with this trend, some quite old, like the appointment of primary-care physicians as gatekeepers to more expensive, specialized services, and some new and revolutionary, like “big data” techniques that speed adoption of more effective treatments. They all share a focus on rewarding good medicine rather than reimbursing providers for whatever they choose to do, regardless of the results. Until now there was not much question the “quality revolution” in health-care policy would continue no matter which party controlled Washington: Other than simple denial of care, getting more “bang for the buck” has made sense to Republicans as well as Democrats, regardless of their differences in the role they assign to markets or governments in promoting better-quality health care at lower costs. But the health-care providers who have been enriched by the old system where they called the shots and both private and public insurers paid the bills may beg to differ. So it could be bad news all around if Tom Price does indeed turn out to be a hidebound doc fighting for his profession’s financial stake in fee-for-service health care. The crucial test will be whether the ultimate Obamacare-repeal legislation which Price will presumably oversee kills without replacing the Center for Medicare and Medicaid Innovation that has been driving the transition to value-based health care, mostly through Medicare. Republicans genuinely interested in holding down public and private health-care costs without radically reducing coverage should pay special attention to the direction Price and the entire Trump administration take on this issue. Tossing millions of people out of their current health insurance will be bad enough. Continuing a discredited system that encourages wasteful spending for the enrichment of medical professionals and hospitals at the expense of patients would be much worse.